Wheelwriter (6781) 10, 12, and 15 pitch, Bold, Auto Center, Full Line Automatic Correction, Line Find and Relocate. Wheelwriter 2 (6781) 10, 12, 15 and Proportional Spacing, Bold, Auto Center, Full page Automatic Correction, Spell Check, Word Tab, Word Erase, Line Find and Relocate. Wheelwriter 10, Series II (6783) 10, 12, 15 and Proportional Spacing, Bold, Auto Center, 4,000 character Correction Memory, Spell Check, Word Tab, Word Erase, Reprint, Stop Codes, Line Find and Relocate. Wheelwriter 15, Series II (6783) 10, 12, 15 and Proportional Spacing, Bold, Auto Center, 6,000 character Correction Memory, Spell Check, Word Tab, Word Erase, Reprint Justification, Draw, Word Expand, Line Expand, Stop Codes, Line Find and Relocate. Wheelwriter 30, Series II (6787) 10, 12, 15 and Proportional Spacing, Bold, Auto Center, LED Display, 30,000 Character Document Storage, Automatic Correction, Spell Check, Word Tab, Word Erase, Reprint, Stop Codes, Line Find and Relocate. 1000 (6781) 10, 12, 15 and Proportional Spacing, Bold, Auto Center, Automatic Correction, Spell Check, Word Tab, Word Erase, Reprint, Stop Codes, Line Find and Relocate. 1500 (6783) Same as above, with Forms Completion Function, 10,000 Characters of Storage, Envelope and Label Format Storage, Reprint Justification and Draw. 10, 12, 15 and Proportional Spacing, Compact size, 4k Correction Memory, 32,000 Character (15 pages) Document Storage, Advanced Revision Capability, Auto Return, Stop Codes, Justification Playout, Format Storage and Directory. 10, 12, 15 and Proportional Spacing, Compact size, Bold, Auto Center, LED Display, 46,000 Character (25 pages) Document Storage, 4k Correction, Spell Check, Word Tab, Word Erase, Reprint, Stop Codes, Line Find and Relocate. 10, 12, 15 and Proportional Spacing, 4k Correction Memory, 48,000 Character (25 pages) Document Storage, Advanced Revision Capability, Auto Return, Stop Codes, Justification Playout, Format Storage and Directory. 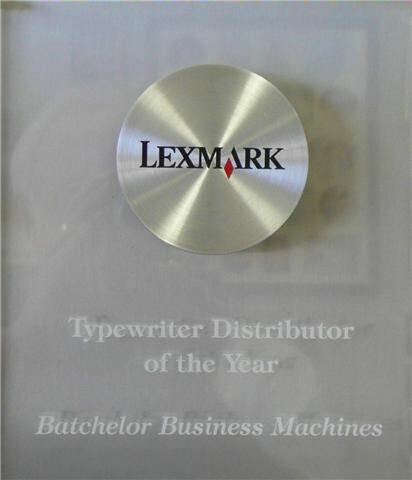 The IBM Wheelwriter 3500 is an advanced text editing typewriter with 60.000 Character (30 pages) of document storage. It has a two line display. Forms storage makes it easy to complete preprinted forms. Wheelwriter 3 (6746) 10, 12 & 15 pitch, 72 Character Auto Correction, Auto Center, Standard Tabs and Margins. Wheelwriter 5 (6747) 10, 12, 15 and Proportional Spacing, 256 Character Correction Memory, 7000 Character Document Storage, Revision Capability, Auto Return, Auto Center, Stop Codes. Wheelwriter 6 (6747) 10, 12, 15 and Proportional Spacing, 256 Character Correction Memory, 31,000 Character Document Storage, Advanced Revision Capability, Auto Return, Stop Codes, Justification Playout, Format Storage and Directory. All Wheelwriters have a 90 day warranty.